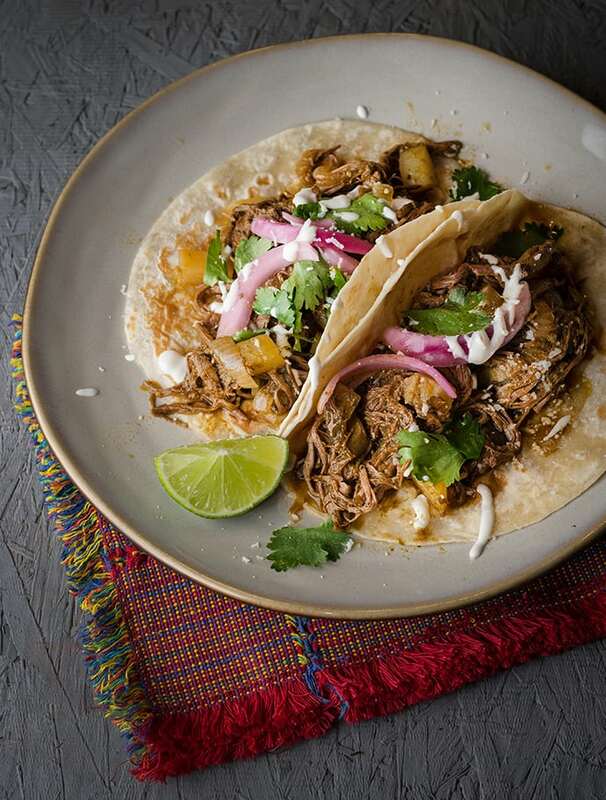 Hello!, We are back, with an amazing recipe for Tinga Verde de Res-Green Beef Tinga. Where have we been? 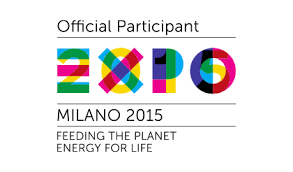 Very busy with our project, giving it our best. We have learned a lot through this journey. Writing a book is not easy and it takes your all and a little more, and some more and right when you think you are done… it needs the last effort. Often it seems like you are never done. After nearly a year things are moving along and soon we promise to give you the full disclosure and we are certain it will be worth the wait. As you can read our sanity is not 100% restored yet, but we hope to return to form and post a recipe weekly. I hope you had the chance to try previously posted recipes in the meantime and now you must be ready for the new ones!. The focus of the blog has always been very diverse in nature and based on seasonal, local ingredients. I enjoy new takes and variations on classic recipes, like my Root-a-touille (a version of Ratatouille made with root vegetables), or pancakes made with nutty delicious buckwheat flour, our French onion soup using a crisp bagel, and even a refreshing vegan version of ceviche substituting cauliflower for fish. 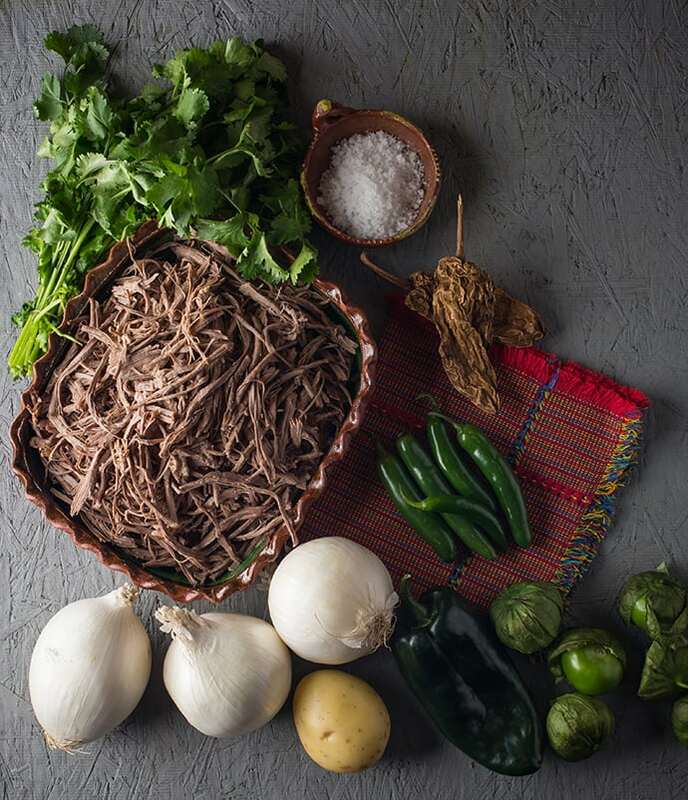 Recipes also include some fundamental techniques, from how to make beans from scratch, and the popular Chilaquiles Manifesto which is quintessential in my Mexican cooking heart. 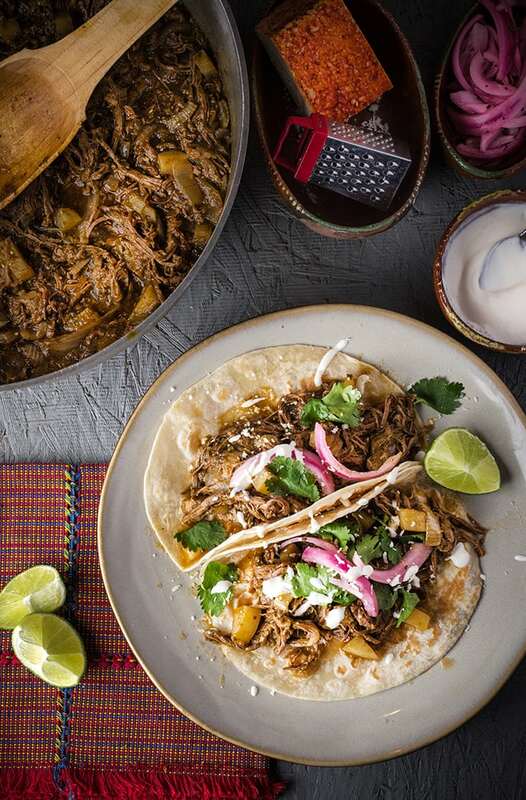 I think you will be seeing more Mexican recipes in future and the occasional twist on a classic and or borrowed inspiration from other cuisines. I have many suppressed cravings and new recipes I intend to share with you in the upcoming weeks and months. I hope you like the new recipes to come, and I hope that you still be here for the step-by-step cooking, the music pairings, the cooking inspiration and the fun. Laying the new grounds, Let’s start cooking! Tinga Verde de Res gives me the warmth and satisfied feeling I need on a fall or wintery day. This recipe of Tinga Verde de Res, its a lesser known variation of the infamous “Tinga de Pollo”. In case you have never heard of this guisado its a home made easy recipe, made with chicken, lots of onions, and smokey chipotles which give this dish its distinct flavor. Why did I choose this recipe this week? I like Tinga de Pollo for the summer, and for the Fall I prefer this Beef Tinga Verde. This heartier version is just what I crave on a cold day. Tinga is not a stew nor a guiso, it stands upright in between. A juicy guisado. 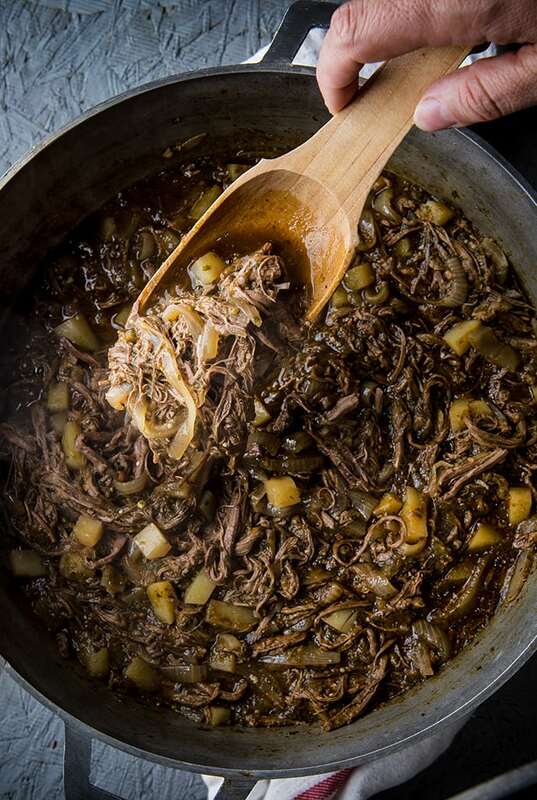 The shredded beef used in this recipe is very lean which gives rich flavor but does not leaves you feeling heavy. I warn you, this Tinga Verde is spicy. However, the sweet onions and the starchy little potato cubes balance the heat. A pot of simmering Tinga will comfort you and make a great meal on any given weekend. It’s a make-ahead dish that gets better the second day. It can be served with a side of rice and beans, or on tostadas (most traditionally) , tacos, or burritos as an informal festive meal. Take this Tinga to a potluck and blow away the tired casseroles. No doubt, people will take note and you will be asked for the recipe. Whatever your choice, I think this Tinga Verde de Res has all the qualities to be one of your new Fall-Winter favorites. Enjoy! or a medium-large piece of beef eye round roast. ½ medium white onion, 1 bay leaf, 8 black peppercorns, 1 teaspoon sea salt. 2 cups of the reserved beef stock in which the meat cooked. 1. In a large pot, place the meat and pour enough water to cover it a ½ inch above. Add the half onion in chunks, bay leaf, black pepper, and salt. Bring to a boil and remove all the foam that forms during the first 10 minutes. Turn down the heat to a slow simmer and cook for about 45 minutes to 1 hour until fork tender. Turn off the heat cover with a lid and let meat rest until cools enough to handle. Save about 2 cups of the beef stock. Shred the meat and set aside. Note: It is important that the meat is still warm when shredding since its easier to shred. Save the rest of the beef broth for future uses, like a chili or a beef stew. Beef stock can be frozen for up to 4 months. 2. 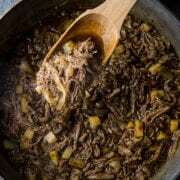 In a large enamel or stew pot, add the oil, and briefly, fry the dry chipotles. Once they have a little color, remove from the pot, set chiles aside. Turn off the heat and let the pot in standby, while you cook the chiles. 3. 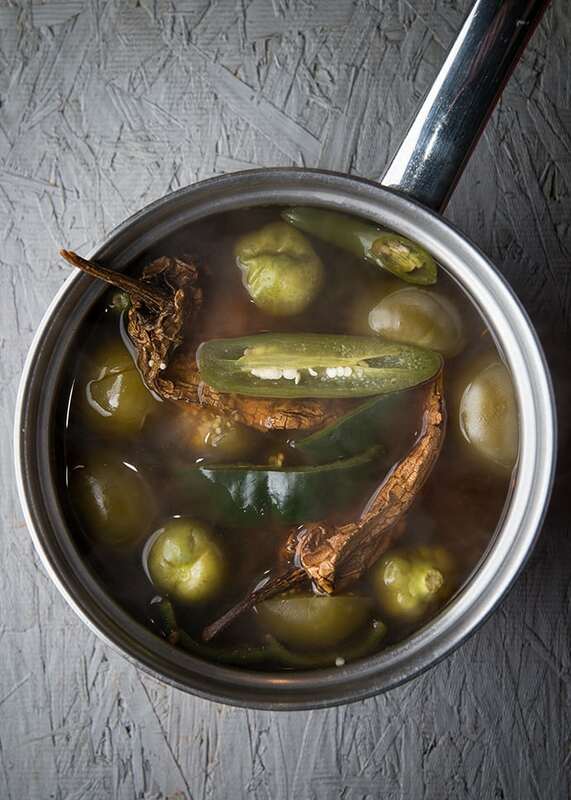 In a small pot boil the Serranos, poblano, tomatillos, and the fried chipotles.Simmer until chipotles are hydrated, about 5 to 7 minutes. Discard the boiling water in which the chiles cooked. 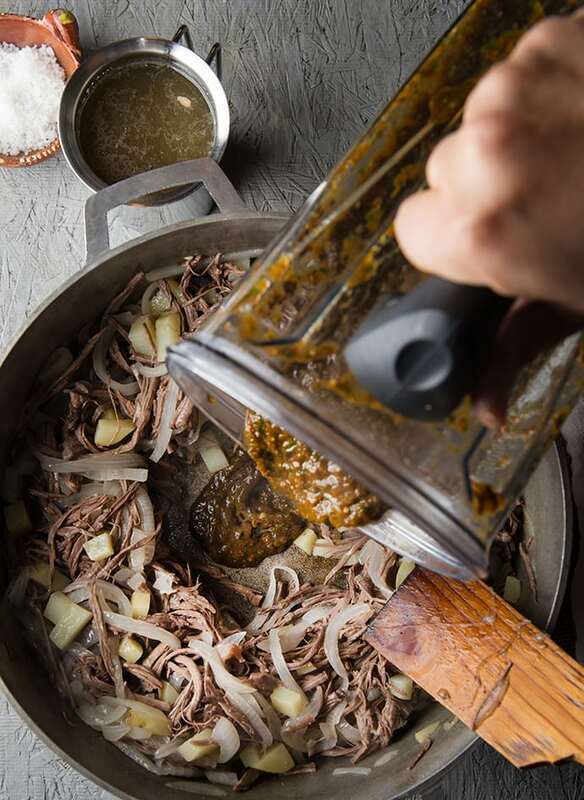 Add all the cooked chiles, cilantro, garlic, salt and vinegar add about ½ cup of the reserved beef stock into the blender and blend until a rough puree. Set aside. 4. In the standby pot with the remaining oil of the chiles, add the slivered onions and potatoes. Cook until onions are translucent. Use medium-low heat, you do not want to put any color on the onions or potatoes, basically, they are just sweating together. Stir them occasionally. 5. 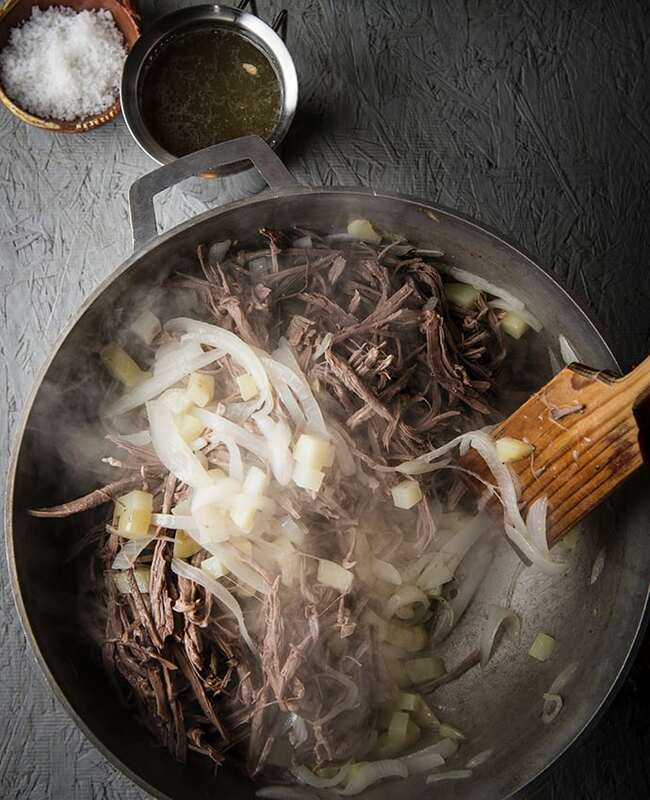 Once the onions are softer and translucent, and the potatoes are cooked halfway, add the shredded and beef toss well. 6. 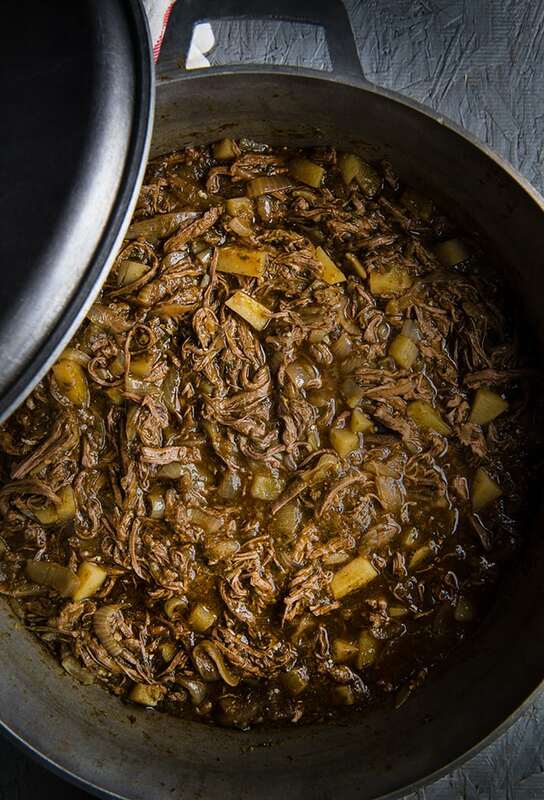 Make an opening in the center of the Tinga meat in the pot and add the chile-tomatillo puree, cook and toss well cook for 5 minutes, then add 1 cup of the beef stock, salt, and black pepper. Bring the temperature up to a rapid simmer then lower down the heat, stir well and cook for 25- 30 minutes with the pot lid ajar, until the potatoes are soft and meat and sauce flavors are well married. Taste for salt and pepper and adjust if necessary. Serving time! Tinga can be served as a main dish with rice and refried beans. The most common way to serve Tinga in Mexico, since is an informal meal, is served on Tostadas, Tacos or Burrito filling using flour or corn tortillas. Tinga can be topped with Mexican Crema, queso añejo, quick pickled onions, and finely shredded iceberg lettuce. This time I made tacos with flour tortillas, red pickled onions, queso añejo, and a drizzle of crema to tame the heat, along with a squeeze of lime juice. A glass of beer or agua fresca and you are all set for a great homemade meal. A spicy version of the Red tinga utilizing green tomatillos, serrano chiles, and the smoky chipotles. One pot dinner, homestyle Mexican comfort food at its best! 3 lbs Skirt steak or short steak = Falda de res or a medium-large piece of beef eye round roast. cook with: ½ medium white onion, 1 bay leaf, 8 black pepper corns, 1 teaspoon sea salt. Cook and shredded. 2 cups of the reserved beef stock, in which the meat cooked. 1. In a large pot, place the meat and pour enough water to cover it ½ inch above. Add the half onion in chunks, bay leaf, black pepper, and salt. Bring to a boil and remove all the foam that forms during the first 10 minutes. Turn down the heat to a slow simmer and cook for about 45minutes to 1 hour until fork tender. Turn off the heat cover with a lid and let meat rest until cools enough to handle. Save about 2 cups of the beef stock. Shred the meat and set aside. 2. 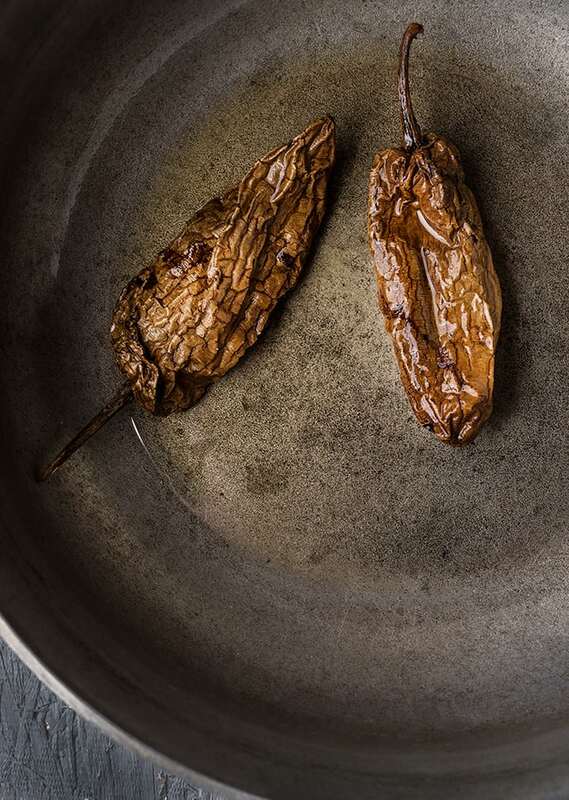 In a large enamel or stew pot, add the oil, and briefly, fry the dry chipotles. Once they have a little color, remove from the pot and set chiles aside. 3. 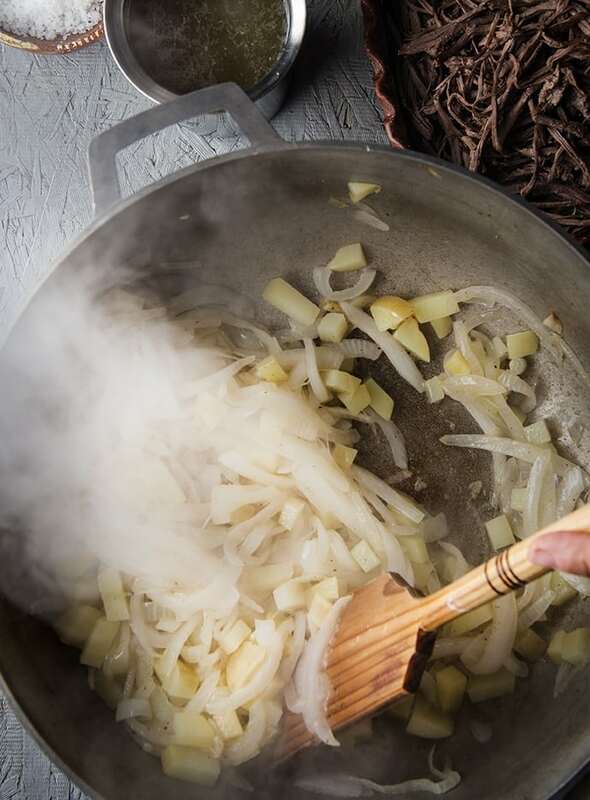 Using the remaining oil in the same pot add the slivered onions and potatoes and cook until onions are translucent. Use medium-low heat, you do not want to put any color on the onions or potatoes, basically, they are just sweating together. Stir them occasionally. 4. Meantime, on a small pot boil the Serranos, poblano, tomatillos, and the fried chipotles until soft. Discard the boiling water in which the chiles cooked. 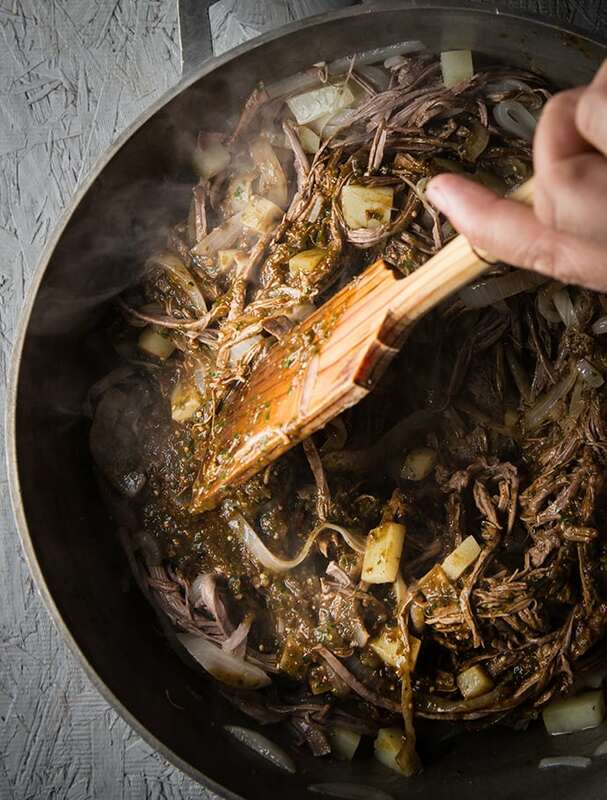 Add all the cooked chiles, cilantro, garlic, salt and vinegar add about ½ cup of the reserved beef stock into the blender and blend until a rough puree. 5. Check on your onions. By now they should be softer and translucent, and the potatoes should be cooked halfway. Add the shredded and beef toss well. 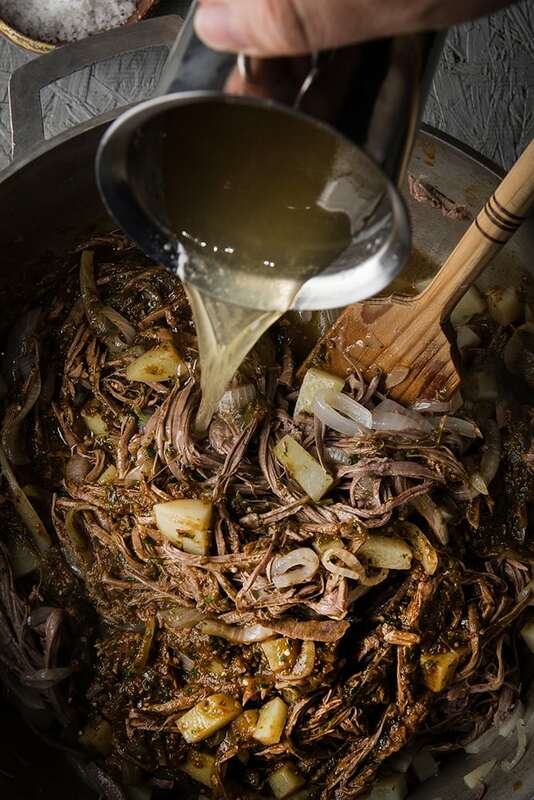 Make an opening in the center of the Tinga meat in the pot and add the chile-tomatillo puree, cook and toss well cook for 5 minutes, then add 1 cup of the beef stock, salt, and black pepper. Bring the temperature up to a rapid simmer then lower down the heat, stir well and cook for 25- 30 minutes with the pot lid ajar, until the potatoes are soft and meat and sauce flavors are well married. Taste for salt and pepper and adjust if necessary. Serving time! Tinga can be served as a main dish along with rice and refried beans. The most common way to serve Tinga in Mexico, since is an informal meal, is served on Tostadas, Tacos or Burrito filling using flour or corn tortillas. Tinga can be topped with Mexican Crema, queso añejo, quick pickled onions, and finely shredded iceberg lettuce.